When you open the Builder, it loads the initial Dashboard page. 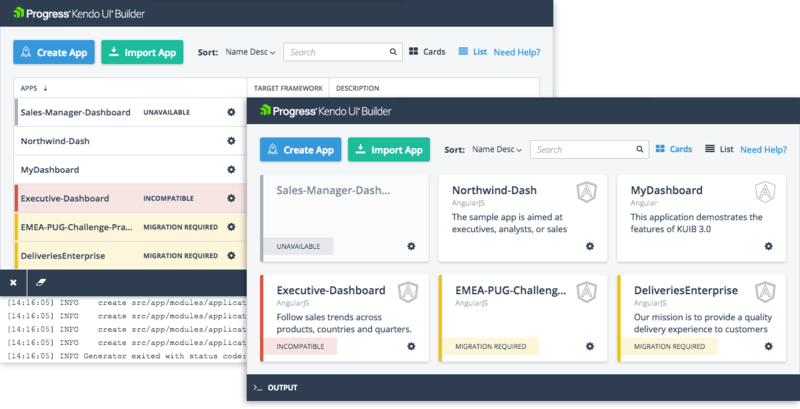 The Dashboard is the user interface that assists you when you create an application, edit existing one and handle its settings. The page maintains the Cards and List views from where you can access the projects in the Builder. 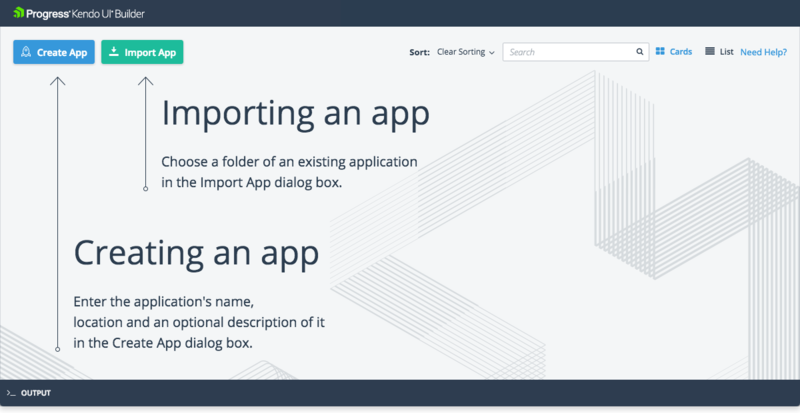 When you load the Builder for the first time and you have no current projects yet, the Dashboard provides the Create App option for creating a new project and the Import App option for importing existing projects. For more information on creating and importing applications, and managing their modules and data providers, refer to the articles on designing the application. Working a long time on a project might cause unintended issues with your application, which make it impossible for you to work with it. In such cases, to notify you about the further actions that are needed, the Builder adds an App State Label to the card of the application. For example, you might have to upgrade the Builder, import an application that was created with an earlier or later version of the Builder, or altogether delete your application from the file system. For more information, refer to the documentation on handling the application state and migration. To facilitate the troubleshooting processes when you build applications, the >_OUTPUT bar displays the log messages. For more information, refer to the articles on output modes and debugging options and troubleshooting.